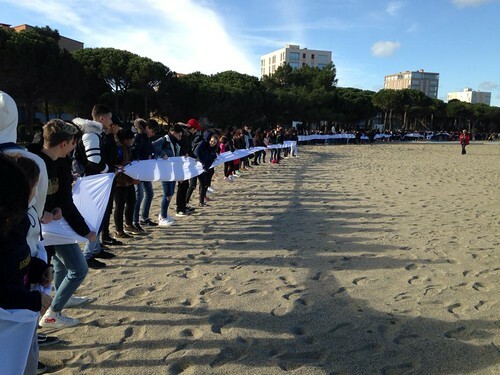 The action is organized by the working group “Exile, Deportation and Holocaust”, formed by secondary schools from the Alt Empordà, in collaboration with the Centre d’Intérpretation et de documentation sur l’Exil i la Retirada, the Memorial Museum of the Exile (MUME), the Mémorial Camp of Rivesaltes, FFREEE, and the EUROM, in the framework of the commemorative programme of the 80th anniversary of the Spanish Republican exile and deportations. At the last stage of the Spanish Civil War (1936-1939), on February 10th, 1939, General Franco’s coup army concluded the occupation of Catalonia. Seeing the Francoist advance, over 450,000 Spanish Republicans fled across the border into French territory. That massive exile was known as la Retirada (the Retreat). A few months before in France, precisely on November the 12th 1938, the government of Édouard Daladier approved a Decree-Law allowing the internment of “undesirable foreigners” under permanent surveillance. This law became the legal framework in which the French government later on imprisoned some 350,000 exiled Spanish Republicans in different rashly built concentration camps, many of them in the Roussillon area. The refugee camp of Argelès was the first one to be set up for civilians in France. The chosen location was a piece of land of 100 ha along the coastline, that started to be built a few days before the French authorities opened the borders. On March 1, 1939, 74,000 people including civilians and soldiers found themselves locked up in a huge, deserted beach area encircled by a barbed-wire fence and supervised by colonial troops of the French navy. The lack of lodging structures, as well as unsafe water supply and food scarcity, added to the exiled people’s poor health conditions caused the spreading of several diseases that, in turn, led to a dramatic increase in mortality among refugees.